Potted beef began life centuries ago as a way to preserve meat - but probably only for a few weeks or months. The idea was to cook beef down until really tender, then mash it to a paste, ram it into a small pot and seal the top with melted butter. So once you broke the butter seal, the paste would start to deteriorate, which is why it was always sold in small pots. 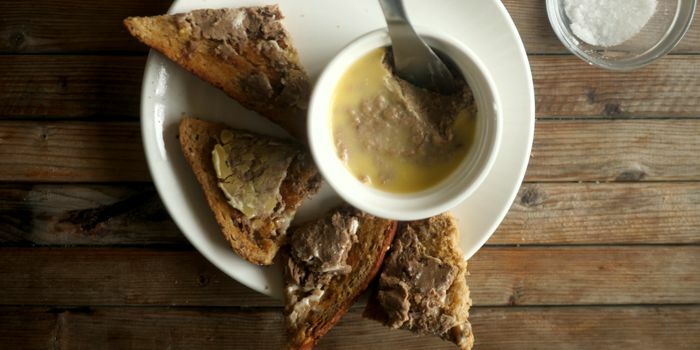 Potted beef is really great on a piece of toast, on a cracker, or in a sandwich. And it's quite easy to make. Cheap cuts of beef are fine for this recipe. Remove any fat, and chop the beef into small dice. There are several ways to cook the beef, and your choice depends on what equipment and how much time you have available. The quickest way is in a pressure cooker - 30 minutes will do it. In a conventional pot or pan, it will take 3½ hours. Or in a slow cooker/crockpot it will take 8 hours or overnight. So, put your chopped beef in the cooking vessel, cover with water to a depth of 1 centimetre/half an inch. Bring to the boil and skim off any scum. Add a beef stock cube, the mace and the salt. Cover and cook for the time specified above. If you're using a conventional pot, you'll want to stir it now and again to make sure it's not sticking. At the end of cooking, the beef should be falling-to-bits tender. If the meat is sitting in a lot of liquid, whack up the heat and reduce it until you only have a couple of tablespoons left. The easiest way to turn your meat into a paste is to whizz it in a blender - you'll need to add that residual liquid to make it work. Blend until the meat becomes a pulpy collection of fibres. Or if you want to be old-fashioned about it, pound it in a mortar and pestle. You can pot your beef in small sterilized jars, or open-topped ramekins. Pack the paste in tightly so there's no air bubbles in there. Melt the butter and pour a thick layer over the top of each container. If you really want your beef to last longer, it's a good idea to use clarified butter or ghee, but this is not really necessary if you keep it in the fridge. The video above is from the Keef Cooks YouTube channel. Click here to see the video recipe of Potted Beef on YouTube. Enough water to cover the beef.